How can your store succeed in 2018? 1. How many items does your online store offer from each brand that you sell? You'll want to make a list with 3 columns: one with the brand and one with the approximate number of items on your site. In the third column, enter in the total number of items offered by the brand. Shoppers often seek the website with the greatest selection. For which brands are you missing the most items? You'll most likely want to sync with the Smart Brands since they help you show more product with no work. 2. Your website offers a online gift registry? Registrant (e.g. bride) can register self? Registrant can login and review purchases? 3. Your website allows shoppers to post a review? 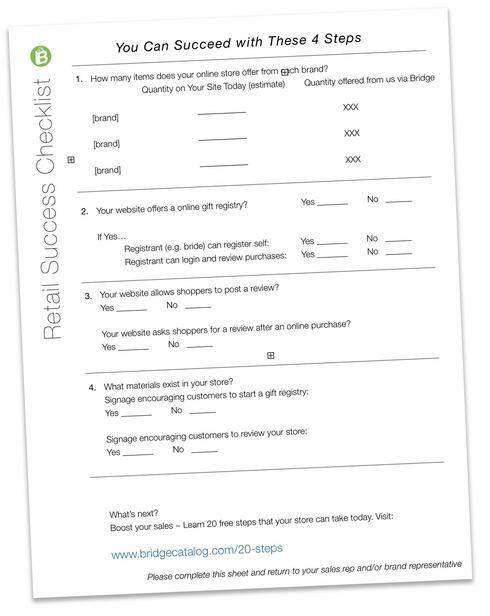 Your website asks shoppers for a review after an online purchase? Signage encouraging customers to start a gift registry? Signage encouraging customers to review your store?